Described as “one of the great figures of our time” by historian Jacquelyn Hall, Braden died in 2006 leaving a remarkable legacy as a grassroots organizer, committed journalist, civil rights leader, movement strategist, social chronicler, public intellectual, teacher and mentor to three generations of social justice activists. In the midst of production at the time, the filmmakers continued with the documentary with other producers graciously contributing additional media. In the film Braden is articulate, insightful, challenging, self-effacing, and charming. Her reflections on the significance of a lifetime of racial justice organizing are interspersed with commentary from civil rights leaders, organizers, historians, students and friends who intersected with her at key moments in her life. Archival material of the civil rights movement and historical and contemporary footage of Anne participating in the social justice community are juxtaposed with a variety of interviews. In a time of war, terrorism, economic uncertainty, religious controversies and a very polarizing atmosphere, unresolved issues around race and racial justice, civil rights and civil liberties, class and gender equity inform our national debates. Braden engages audiences with a unique southern voice for a much needed discourse on the continuum of struggle for civil rights and civil liberties from the founding of our democracy to the present, and the responsibilities of whites to join the fight against racism and white privilege. 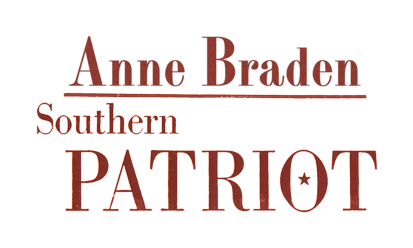 Through this exploration of Anne Braden’s story we see not only the dangers of racism and political repression but also the power of a woman’s life spent in commitment to social justice. Anne Lewis is an independent documentary-maker associated with Appalshop and currently a Senior Lecturer at the University of Texas-Austin School of Radio/Television/Film. Her work reveals working class people fighting for social change. Anne was associate director/assistant camera for Harlan County, U.S.A., the Academy Award-winning documentary about the Brookside strike. After the strike, she moved to the eastern Kentucky coalfields where she lived for 25 years. Documentaries she produced, directed, and edited include: To Save the Land and People (SXSW, Texas Documentary Tour) a history of a militant grassroots environmental movement; Justice in the Coalfields (INTERCOM gold plaque) about the community impact of the Pittston strike; On Our Own Land (duPont-Columbia Award for independent broadcast journalism) about the citizens’ movement to stop broad form deed strip mining; Chemical Valley, co-directed with Mimi Pickering (P.O.V., American Film and Video Blue Ribbon) about environmental racism; and most recently, Morristown, a working class response to globalization. Her documentary Fast Food Women about women struggling to raise families in minimum wage jobs with no benefits received national airing on P.O.V. and was part of a Learning Channel series of films about women by women. This project is funded and supported in part by the City of Austin through the Cultural Arts Division believing an investment in the Arts is an investment in Austin’s future. Visit Austin at NowPlayingAustin.com.